First I would like to share this. I saw it on facebook today, but I have seen it before. "Those who have the gift of inspiration exude something that's difficult to pin down intellectually, yet is undeniably recognizable in how you feel in their presence!" Father John in Madras India who ran an orphanage and Sister Mary Dymphna in Sri Lanka who left Ireland to be a Nun when she was 13. Gladys Alward when I was 15 and my friend Joan in Minnesota. More recently, I have to say I'm always inspired by my Teaching peers, that's why Houston is so exciting for me. That said, I had a really hectic day in preparation for a day of flights tomorrow. Destination Florida…. what for….? The mirrors ordered in Mexico for the hotel arrived today. I have to say they were packed superbly….BUT someone dropped one….XXXXXXXXXX somewhere en-route. Now in saying that they are all different sizes but I guess I could say the average measurement is about 8ft. 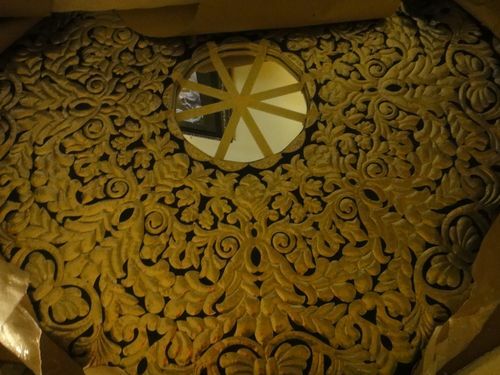 Some of the mirrors are large in very ornate frames…. one has 1000 hand beaten roses. Some are small in BIIIIIG frames. I personally think at least one of them needs to be admired in the dining room. Talk about applique… No, it's hand carved silver. it will fit very well into our textile area. This is the drawing I finished for the 27ft bench seat. 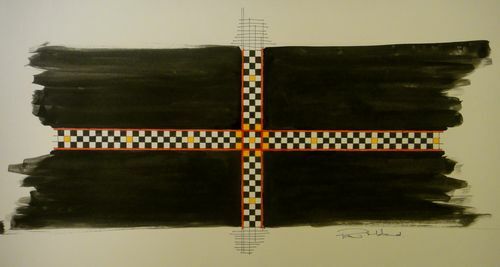 Its not to scale… as I mentioned the seat is 27 ft long and 4 ft wide but the squares will be 1" and the red will be 1/4" it will be quilted into 1" squares and adorned by gold, red and black bench cushions. it will be in our gallery where you can sit and view the textiles on the walls. Time to pack and check everything. Love the African video I just watched on the Quilt Show! Wasn’t surprised though……..
Next PostSouth African Quilt Show Video.